Having sparkling white teeth is on everyone's list, but what if the sparkle comes from a gem instead? A lot of young ladies are embracing an underground fashion trend that originated in America and is slowing emerging in other parts of the world. Tooth gems and stones are tiny little crystal-like objects commonly applied to an upper front tooth but can be applied wherever the individual desires. It has been all the sensation in western countries and is catching on in UAE, Kuwait, Saudia Arabia, as well other countries in the middle east. The most popular gems are made from either real diamond or zircon and are usually between 1.5 and 2.5 millimetres in diameter. You can even buy tooth gems made of Swarovski crystal if you want something truly glamorous. They come in various styles and colours, including simple round jewels, star shapes and even rose-shaped gems. Tooth gems can be affixed at home with a special kit; either by yourself or by someone you trust to get it right. But is always best to have a professional makeup artist for the procedure if you really want your tooth gem to look dazzling. 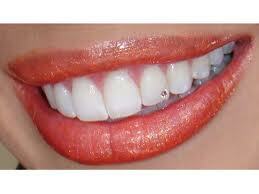 The procedure is painless and does not affect your teeth in any way. Would you try this? Let me know!